Westminster Sensory Park | KaBOOM! Walnut Creek Open Space Trail in Westminster, CO is bursting with nature. Rabbits, muskrats, hawks, and beaver inhabit the area, and amongst all the trees and grass you can almost forget you're in the city. Until you hear the rumble of wheelchairs rolling over concrete and cries of "push me higher!" That's when you realize that The Children's Hospital Northwest Facility is nearby, and some of its many outpatient visitors are enjoying the Sensory Park before a therapy session. This universally accessible playground is not only for patients, but also for their siblings, families, and anyone else who wants to play their cares away. The smooth transitions between surfacing help out toddlers taking their first precarious steps, as well as grandparents who use a cane or walker. Painted edges along the paths and two-tone steps aid those with visual impairments, and the picnic tables are wheelchair accessible. This epitome of inclusion is a far cry from the jungle gym on asphalt originally planned as the play area for the Northwest Facility. Luckily for the park's visitors, the hospital approached the City of Westminster in 1998 for support in building a fantastic play experience for all community members, and the City wholeheartedly agreed. Without any outside help, Children's Hospital only had $35,000 to put toward a new playground. While this may seem like a lot of money for one playground, it wasn't nearly enough to create the beautiful, fully accessible park of their dreams. But then the City of Westminster got onboard and provided the land, site design, construction, maintenance, and $25,000 toward equipment. Next, city staff applied for and received a Great Outdoors Colorado Grant and a Jefferson County Joint Venture Grant, both in the amount of $35,000. 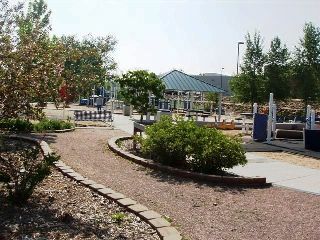 Once the Home Place Land and Cattle Co. (owner of the Northwest Facility's building) agreed to provide water and shelter for the playground, the Sensory Park was ready to blossom. But what features should be included in this exciting new project? The answer was found by Landscape Architect Kathy Piper and others involved in the playground's design when they sat down with therapists and parents and simply asked. The responses showed a strong desire for activities and structures that are fun but therapeutic, promoting socialization and self confidence, while providing access to children and adults of all abilities. That's a pretty tall order, but the design team delivered a space that fits the bill and then some. The park gets its name from the wide array of sensory experiences available to all visitors. There is a variety of plants surrounding the playground, as well as a planting table used during therapy sessions. Concrete paths are embedded with grooves and textured bumps, providing those in wheelchairs a wild ride –and typically developing siblings often ask to borrow their brother or sister's wheelchair for a spin. Areas of gravel and sand were specifically requested for the extra effort required to roll or walk across them, allowing children that choose these paths to build muscle while having fun. Water play, sand play, and musical panels - always playground favorites - add to the sensory experience. Swings with different seating options allow visitors to find the "just right" fit for them, and shade structures are abundant to keep the sun off of sensitive skin. 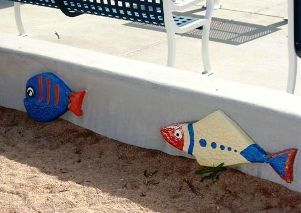 Already a site to marvel at, the park was made even more visually appealing with the addition of handmade, brightly colored fish that adorn the sitting wall. But the coolest feature of the playground by far is that no one would guess by looking at it that it was designed with special needs in mind. To the casual viewer, it looks like all the other playgrounds in Westminster, which was the aim from the beginning. 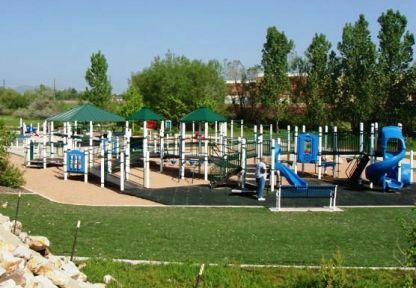 By not seeming like a "special" area only for a select group of kids, the Sensory Park is a comfortable place for all children and families to enjoy regardless of their abilities. And when playgrounds can be as beautiful and fun as this one, "there's no reason to not be accessible," says Piper. 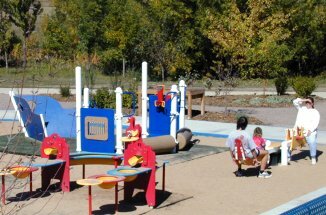 Each year outstanding regional parks and recreation projects are recognized with the Colorado Lottery Starburst Award. At the ninth annual awards, Westminster Sensory Park received the prize for projects costing between $100,000 and $300,000. The park also beat out other regional winners to take the People's Choice Award, decided by Colorado Parks and Recreation Association members across the state. Another great compliment for the Sensory Park is the fact that groups from several different states have been calling for information on how to create such unique and inclusive spaces in their communities. But the biggest thumbs-up of all comes from the families that visit the Sensory Park. Siblings can interact with each other in a barrier-free environment and forget about therapy and disabilities. Visitors of all backgrounds and ages can enjoy the available amenities, have a great play experience, and interact with nature in the middle of the city. What more could you ask for?The answer from Westminster Sensory Park fans is surely a content "nothing."